When I wrote Why Advocacy and Market Forces Fail Education Reform almost four years ago, I had recently spent a great deal of time researching and writing about school choice within the focus of parental choice. Then as well as now, the ever-growing body of evidence shows that school choice, parental choice, and market forces never achieve the outcomes advocates claim. And yet, each year we must suffer through School Choice Week, which is just a slightly heightened and compressed example of the same sort of misleading advocacy that exists every week of the year in the U.S. Choice, we must acknowledge, in the U.S. is a sort of consumer choice: We must allow people the choice of either a Honda Accord or a Toyota Camry (but choosing not to drive shall not be on the table). 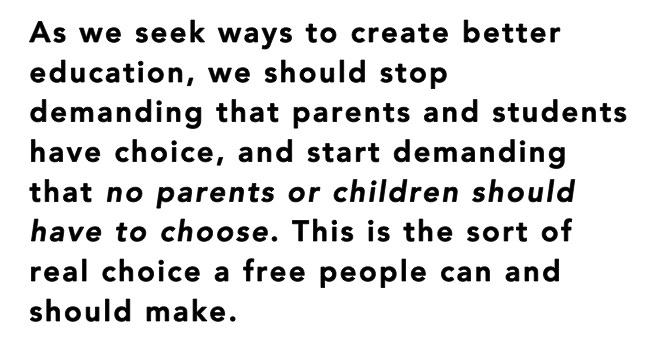 So when any school choice advocate launches into the typical blather that we must give all parents the sort of choice that wealthy parents have (one of the most insincere and distorted examples of manipulative rhetoric you’ll hear), we must not allow the debate to remain within a skewed choice-only context. Again, the evidence is overwhelming that public, charter, and private schools have about the same impact on students once we adjust measurable student learning by external factors. Private schools appear to be better mostly because they are selective (think of judging hospitals that admit only healthy patients compared to hospitals that admit all patients), charter schools waving higher achievement fail to note that such measurable gains tend to equal the longer days/years and are not attributable to any aspect of “charterness” (my analysis of two years of charter schools in SC shows that fewer than a handful of over 50 charters outperform comparable public schools), and both private and charter schools reveal that choice often contributes to negative outcomes such as segregation, teacher and student churn, and inequitable opportunities for marginalized students such as English language learners and special needs students. And while private schools as powerful models of what market forces produce fail to show that type of schooling impacts significantly student achievement, that parental choice advocates ignore the qualities of private schools most attractive to parents illustrates the insincerity of school choice proponents: private schools popular with the affluent have very low student/teacher ratios, yet class size is routinely discounted as important among reformers who embrace choice; private schools offer rich curricular offerings including so-called electives that are being cut and marginalized in public and “no excuses” charter schools. Choice in education is an ideological lie driven by an idealized faith that ignores the negative consequences of choice: some parents choose for their children to drop out of school, some parents choose to smoke with their children in the car, some parents choose to place their children in schools based on racist and classist beliefs. School Choice Week, then, is a marketing scam. Don’t buy it. ← The Real Education Crisis? Great piece. Thanks for your insights on this very important issue. Pingback: Don’t Buy School Choice Week | My BlogThe Philosopher's blog.